Now Cisco has released its February 2016 mobile VNI report, CTIA’s attempt to bury its own data has backfired, because Cisco has retrospectively revised its prior estimates of North American mobile data traffic downwards by more than one third. 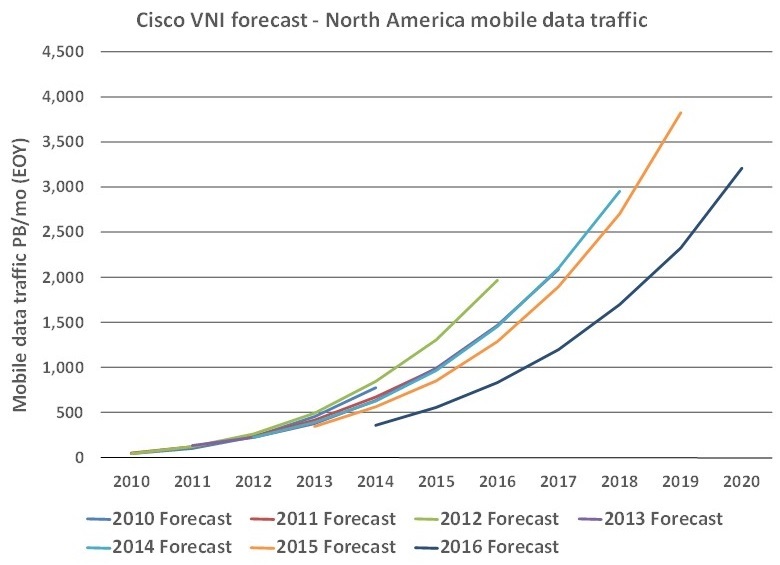 Cisco’s estimate of EOY North American mobile data traffic in 2014 has been reduced from 562TB/mo in the Feb 2015 mobile VNI to only 360TB/mo in the new release, which makes it almost the same as the estimate of 2013 traffic in last year’s publication (345TB/mo). Similarly the estimate of 2015 traffic has been reduced from 849TB/mo in last year’s publication to only 557TB/mo this year, a loss of more than an entire year’s growth. The chart below highlights the impact of this massive revision to Cisco’s estimates, showing that when combined with previous revisions, the latest estimate of traffic in 2014 is less than half the figure projected by Cisco back in February 2010 (which was used by the FCC as one of the traffic estimates in its infamous October 2010 paper). Ironically, Cisco’s latest revision actually brings its estimate of US mobile data traffic for 2014 (323TB/mo at the end of the year – from the online tool, the North America figure above includes Canada) below CTIA’s own total of 4.1PB for the year as a whole (i.e. an average of 340TB/mo) meaning that in fact CTIA would have been better off using its own data. Of course that wouldn’t have had the desired effect of trying to make the FCC feel good about its hopelessly flawed 2010 paper and justify CTIA’s own attempt to disinter this methodology and use it to claim a spectrum crisis is still imminent. UPDATE (2/4): Oddly, in a blog post Cisco asserts that the revision was so that the “2014 baseline volume adjustment now aligns with CTIA’s figures.” That’s actually wrong: the Cisco estimate represents an end-of-year figure (the first line of the report states “Global mobile data traffic reached 3.7 exabytes per month at the end of 2015“) and given that the monthly traffic is growing (one assumes relatively consistently) through the year, it is implausible for the final month of the year to have less traffic than the average for the year as a whole. However, it is certainly very ironic that Cisco has chosen to (try and) align its traffic figures with CTIA at precisely the time when CTIA wants to bury its own numbers in favor of more optimistic growth estimates. 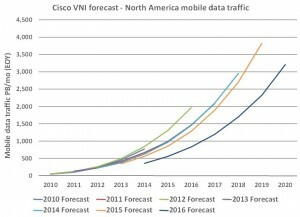 Specifically, Cisco’s latest VNI forecast shows that the FCC’s estimate that traffic would grow by 35 times between 2009 and 2014 (a reduction from Cisco’s own estimate of 48 times growth) was actually 50% too high, because according to the latest Cisco data, North American traffic grew by only 22 times between 2009 and 2014 (unless of course Cisco has also made some undisclosed retrospective revision to its 2009 data). As usual, Cisco has not provided any detailed explanation of this dramatic change in its numbers, though part of the cause seems to be a further increase in the assumption of offloaded traffic in 2014 and 2015: the latest forecast claims offloaded traffic on a global basis will grow from 51% in 2015 to 55% in 2020, whereas the previous version claimed growth from 45% in 2014 to 54% in 2019. However, this certainly can’t account for the scale of the change and Cisco must have revised many other individual elements of its traffic estimates in order to reduce its estimates by such a large amount.